If the weathermen are to be believed we have one heck of a storm coming towards Chicago the next 2 days, followed by some cold air. I do often have my doubts about their reliability. In my next life I want to come back as a weatherman, as they can be wrong most of the time, and still keep their jobs. In fact, I think that I guess as well as them sometimes. But this might be different. Warnings are coming from all sources, and sides. I went to the grocery store today to make sure that I had enough food for 3-4 days, it was packed, you would have thought that it was the day before a major holiday. Additional cat food will be purchased on my way to knitting tonight—that would actually be the most painful thing to run out of. Lloyd would just look at me and go to his bed, but the cats would be non-stop yelling. Running out of yarn for knitting or fiber for spinning will not be a problem however. I have been finishing spinning up the rest of the green and purple Fiber Optics roving, and will ply it together tonight. That way I will have enough to finish my Herbivore scarf while I sit with knitting, books, animals and movies tomorrow and weather out the storm. I am supposed to teach tomorrow night and Wednesday morning, but unless something changes, I will be cancelling my classes tomorrow afternoon. Here is my progress on Herbivore. 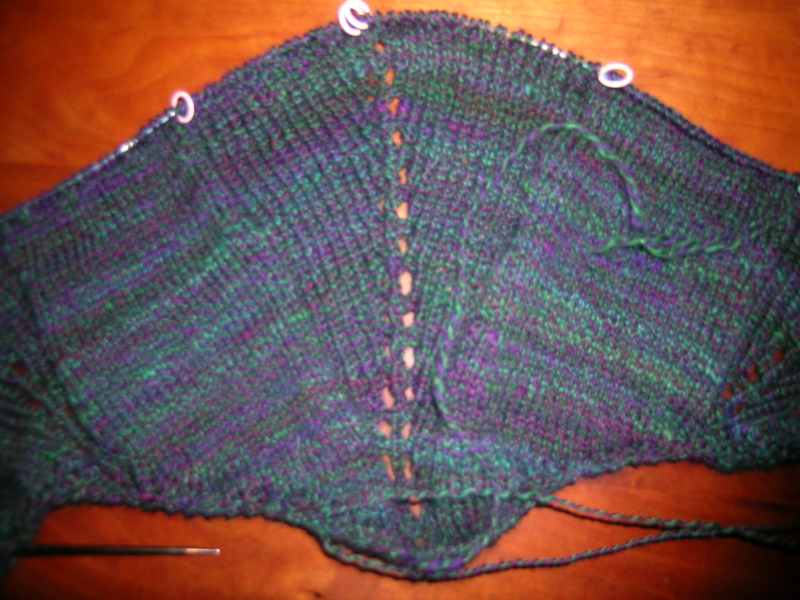 Once you get the set-up rows, it is a very easy knit.